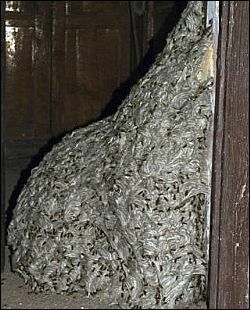 A huge wasps nest measuring 22 feet long (7 meters) has been discovered in an abandoned house on the Spanish island of Tenerife. Police were called to the house in San Sebastián de la Gomera, in the Canary Islands by concerned neighbours and found the enormous nest, containing millions of wasps, in the hallway, according to Spanish news reports. Officers were called out by worried neighbours of the empty home in the island’s capital and say the nest was in an indoor hallway and contained literally millions of wasps. Experts have exmaiend thenest and sya that local wasps would never build a nest of tha size. They believ it must have been made by a wasp that migrated form nearby Africa.